Are you tired of turkey? Are you tired of leftover turkey? Why not use up your leftover vegetables, add cooked beans, grains, or pasta, and donate the bucket of soup to a neighborhood feeding program? Go to www.foodrunners.org/donatefood to learn more! To make the turkey stock, place all the ingredients in a stockpot or large pot, and cover with turkey or chicken stock and enough cold water to cover. Bring to a boil and simmer for approx. 2 hours. Strain the stock into a large container and chill, uncovered. 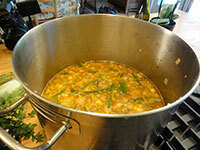 To make the soup, in a large stock pot or large pot, sauté the onions in the oil with a sprinkling of salt. When they are soft add the garlic and sauté one minute more, stirring constantly. Add the celery, carrot, and peppers. Cook gently over medium heat, stirring occasionally, for about 5-10 minutes, or until the vegetables are soft. Add the wine, the ground spices, and the tomatoes, and 8 cups of turkey stock. Cook over low heat for 15-20 minutes, stirring occasionally. Note: This is a great recipe for leftover turkey; however, if you start with a fresh turkey (10 lb.) simply cook the whole fresh turkey for 1 1/2 hours in the water and vegetables for stock. Remove the turkey and let cool until you can remove the meat and return the skin and bones to the stock and cook another 2 hours.